Mesa Verde National Park, located near the southwest corner of Colorado, is home to some of the best-preserved ancient cliff dwellings in the world. The largest structure is called Cliff Palace. It was built by the Anasazi people—ancient ancestors of today’s Puebloans—over 750 years ago. 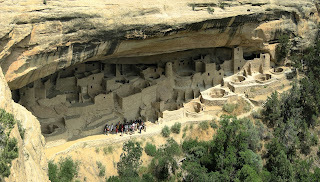 Recent studies reveal that Cliff Palace had 150 rooms and 23 kivas, or rooms used for religious ceremonies. It’s estimated that about 100 people lived at Cliff Palace. 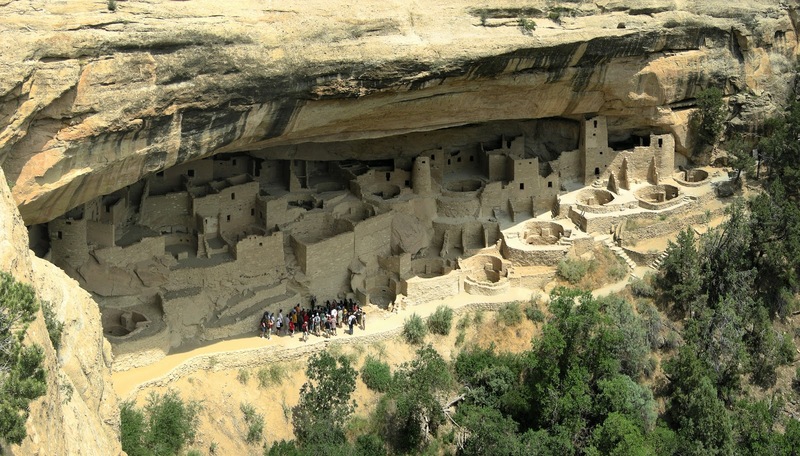 This is quite a departure from the typical cliff dwellings found at Mesa Verde National Park, which contain from one to five rooms each, with many of the single room structures being used for storage. Archaeologists believe that Cliff Palace was used mainly for religious ceremonies. Looking at the size of the doorways in Cliff Palace one realizes just how small the Anasazi people must have been—an average man being about 163 cm (5’4”) tall, and an average woman being about 152 cm (5’0”) tall. The Anasazi’s life span was relatively short, partly because of an exceptionally high infant mortality rate. Sadly, about half of their children died before their fifth birthday, with most adults only living into their mid- to late-30s. One can only imagine the hardships they must have faced! Cliff Palace is mainly constructed of sandstone, mortar and wooden beams. The Anasazi would collect hard river rocks and use them to shape the larger sandstone blocks for the bulk of their structures. For mortar, they used a mixture of soil, water and ash. They would fill the gaps in the mortar with smaller “chinking” stones to add stability to the walls. Then they painted the surface of the walls with colored plaster made from mud and clay. 1) True or false: Puebloans are the ancient ancestors of the Anasazi peoples. 2) Cliff Palace was used mainly for _______________. 3) True or false: The Anasazi people were much smaller than modern people. 4) Rocks used to increase the stability of the walls of Cliff Palace are called ____________. 5) Cliff Palace was photographed in 1941 by __________.